Melia Cayo Santa Maria hotel for scuba diving and snorkeling equipment. Stay at Meliá Cayo Santa María, 5-star All-Inclusive Hotel, located in Cayo Santa María, and enjoy the diversity of its seascapes, the transparency of its water, the excellent quality of its sand and the captivating enchantment of its coral reefs. 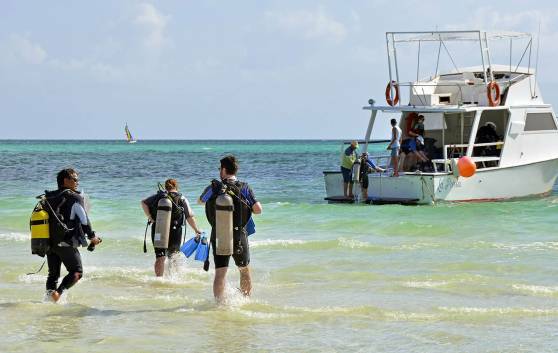 You will find a wide variety of dives to suit all levels of ability in Cuba: scuba diving packages and initiation courses provided by PADI and SSI - certified instructors. This Cuba destination, of spectacular natural beauty, invites you for diving holidays. There are approximately 550 diving points surrounding the Cuban archipelago with exceptional conditions, natural beauty, varied flora and fauna all year round. The largest black coral colonies in Cuban waters are found in areas of the Guanahacabibes Peninsula World Biosphere Reserve. Stunning ocean bottoms, especially in La Corona de San Carlos. The possibility to diving along 100 kilometers of coastline, stretching from Ramilletes de Novia to sites considerable historical value. Especially recommended for those who prefer scuba diving through underwater tunnels inhabited by abundant wildlife. Ideal for submarine photography. Wonderful contrasts in a magical pristine setting. Blue Hole-Ojo del Megano and Cayo Piedras del Norte Marine Park: two exclusive sites. Cave and open sea diving: two basic attractions. Wide variety of coralline species in stunning pristine sea beds. Site of one of the most monumental coralline columns in the Caribbean: Notre Dame. Narrow platform with coralline patches and ridges up to five feet tall. Thirty–two kilometers of coralline formations and warm crystal-clear waters. Magnificently preserved sea beds and the possibility of diving with sharks. Extensive coralline reef formations located relatively near the shore -between Punta Meternillos and Cayo Sabinal- surrounded by high coralline ridges. Excellent for scuba diving. Irregular sea bottom with abundant caves, small valleys, vertical rock outcrops and colorful coralline gardens. Fantastic rocky outcrops, both shallow and deep marine beds ideal for diving along the 150 kilometers of coastline. Reasonable prices and stunning diving areas at Cabo Cruz, a gift for divers. Save with our offers and promotions. Sign up now!